This rustic Wooden Paddle Floor Lamp features wooden canoe paddles with a dark green stain and is topped with a chip wood shade stenciled with pine trees and canoes. 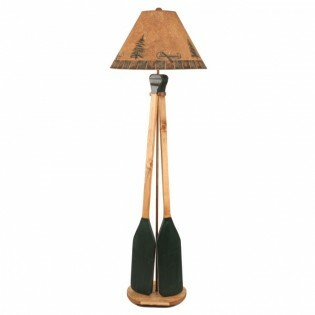 This rustic Wooden Paddle Floor Lamp features wooden canoe paddles with a dark green stain and is topped with a chip wood shade stenciled with pine trees and canoes. Add a rustic touch next to that favorite reading chair with this "at the cabin" floor lamp. Shade Size: 7" x 20" x 13"